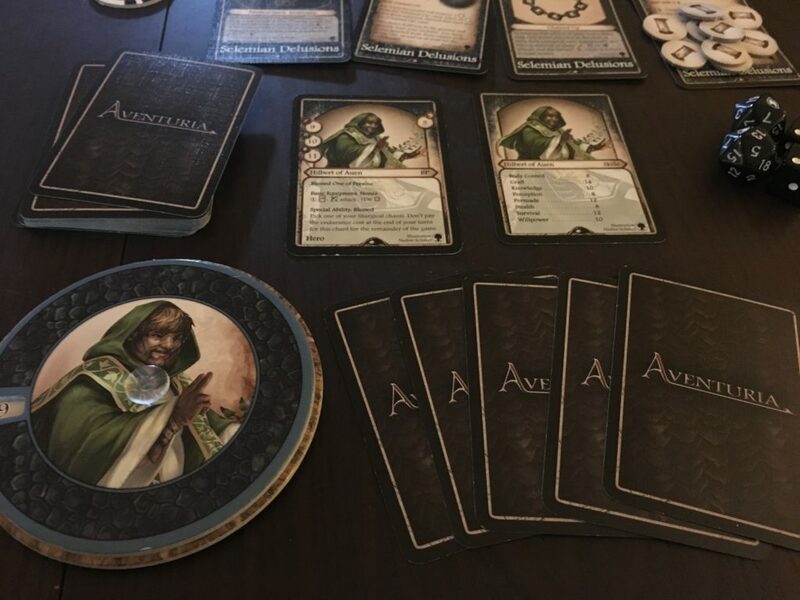 The first Aventuria expansion adds quite a few adventures, henchman cards, reward cards, and more. One of the most exciting things it adds is the new character, Hilbert from Auen. 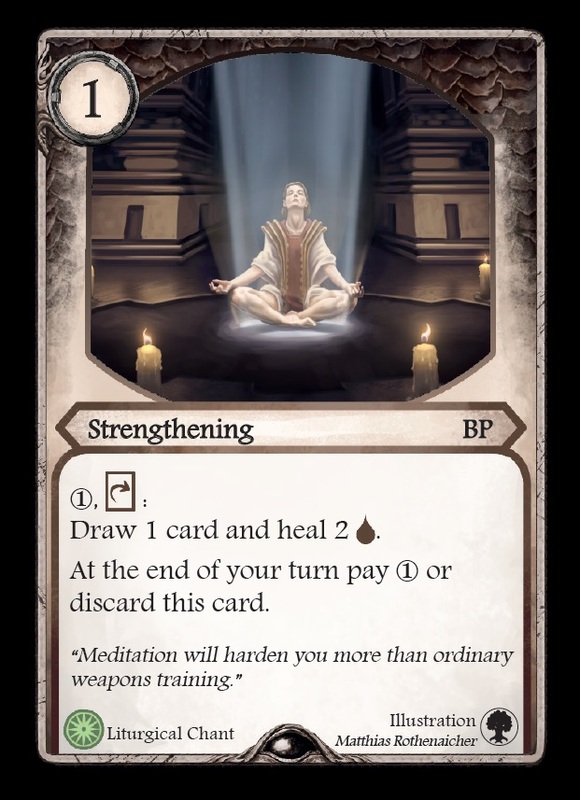 Hilbert is unique in all of the materials produced for the card game so far in that he is a Blessed One of Peraine. 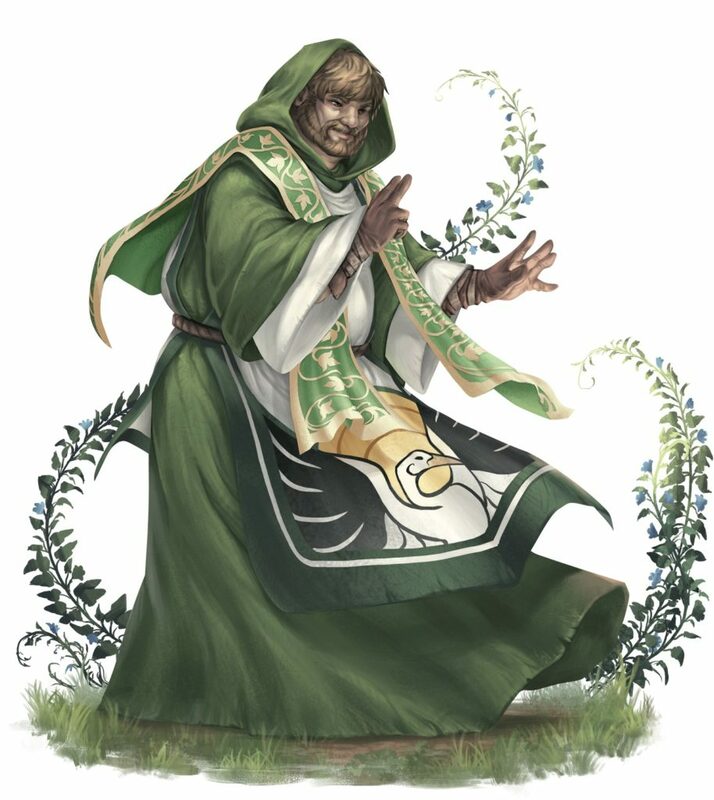 Blessed Ones are the priests and holy people of The Dark Eye, and they use liturgical chants (also called “blessings” in The Dark Eye) instead of magic. So far, he is the only Blessed One that you can play! As you can see, this is a very inexpensive and powerful card, but it has one serious drawback – Hilbert must pay upkeep every turn if he wants to keep it around. Most of the liturgical chants work this way, and this sets up a very different set of strategies. It’s harder to max out your endurance for a round just to bring in a high-value card, since you’re also paying upkeep on the cards you already have around. “Selemian Delusions” is one of two one-act adventures included in Forest of No Return. It is difficult for a number of reasons. First, it has a brutal series of skill checks, culminating in a combat where the heroes start essentially unable to act until they can succeed at another skill challenge during the fight. It also includes two leaders, both of which can hit very hard, and the henchman setup (Animal-Underground, Animal-Sea) includes several more very large opponents. 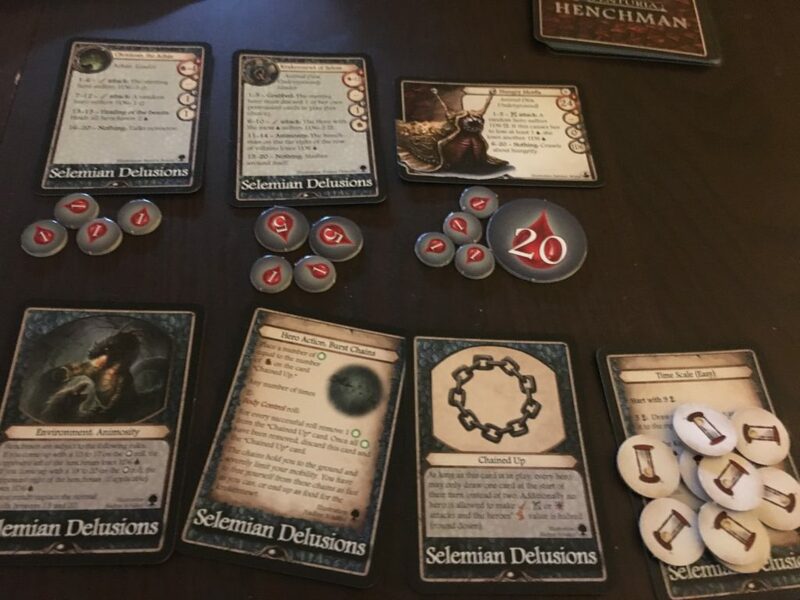 My henchman deck was particularly deadly because it includes the Ship of Lost Souls henchman cards, and there are some nasty sea animals in that expansion as well. The environment can offer some help with the Animosity card, but I didn’t actually see much benefit from it in my setup. The henchman draws for this game were absolutely brutal. I ended up drawing (in order), a Scuttling Crypt Bug (20 life points and 3 armor), a Young Sea Serpent (25 life points and 2 armor) and the henchman version of the Krakennewt (after I had already defeated the Krakennewt of Selem). I took some very big hits over the course of this game, though luckily they were spaced out enough for me to heal a bit. 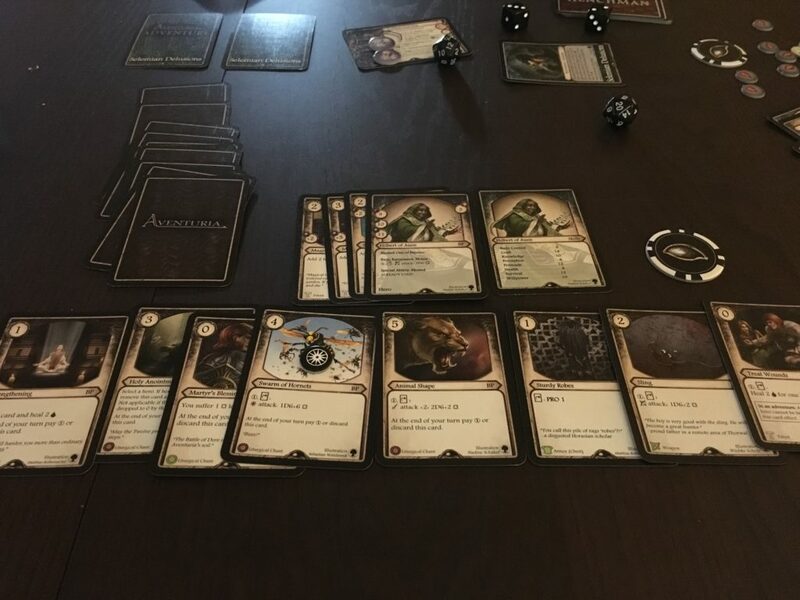 If you can’t tell from this picture, I had 13 Endurance cards! That may seem excessive, but I was taking 5 1-cost actions and paying 4 Endurance upkeep every turn. So I needed that much if I also wanted to be able to play cards. But between my two big attacks (Swarm of Hornets and Animal Shape) and a lot of healing (Strengthening and Treat Wounds), I managed to take down all those huge monsters all by myself. And it only took me 12 rounds on Easy! As you can see, Hilbert may not be able to do a lot of damage right out of the gate like Mirhiban. And he may not have the durability of Arbosh or the dodginess of Carolan. But if you play him well, he can do some amazing things in the service of the Goddess! But watch out for those Krakennewts!